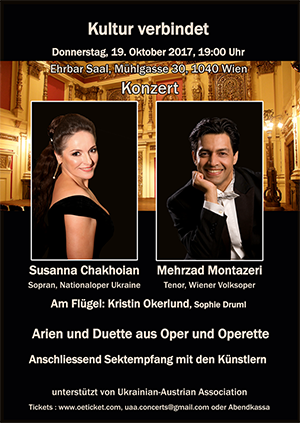 One of the stars of the Vienna concert is Susanna Chakhoian, lyric coloratura soprano. She has been a soloist of the National Opera of Ukraine for more than 15 years. Susanna had opera and concert tours all over Europe. She is a prize-winner of international vocal competitions. She performed together with numerous prominent and esteemed singers from all over the world. After big successes in previous years, Susanna returns to Vienna with the third concert. Her partner Mehrzad Montazeri, a known and esteemed Austrian Tenor, has successfully performed in a series of European countries and beyond. Currently, he is a member of the ensemble at Volksoper Wien. Mehrzad was multiple times awarded in international competitions. At the piano: Kristin Okerlund enjoys an international career as a pianist. She has been accompanying numerous renowned opera singers in concerts in the big halls of Europe, Asia, and the USA. Among other things, she works as korrepetitor at Vienna State Opera. The first part features arias and duets from great Italian operas. In the second part are presented tidbits from the works of Johann Strauss and the most famous operettas of Lehar and Kalman. After the concert, all the guests are invited to a meet & greet with the artists.